When word got out two weeks ago that Yahoo is not 100% committed to Delicious, people who still use the bookmarking service started to panic and look for alternatives. One competing bookmarking site that some people turned to is Pinboard, a barebones bookmarking site which looks a lot like Delicious did in its early years: lean, no-frills, and very useful. The company saw an influx of traffic and activity. 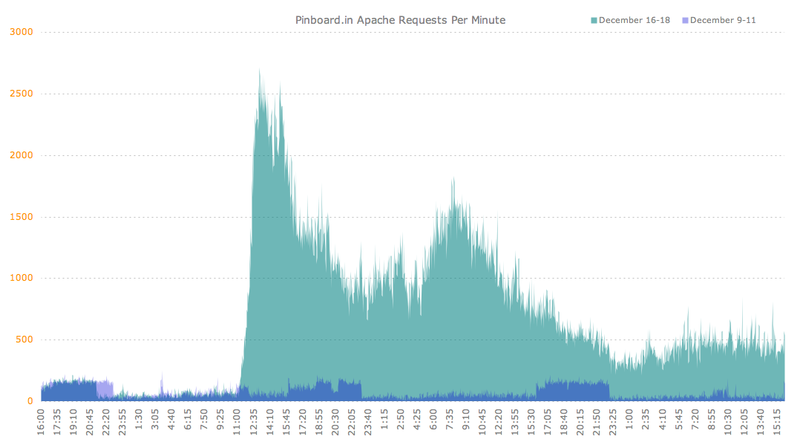 The chart above shows requests per minute to its servers in the three days following the Delicious news compared to the week before. 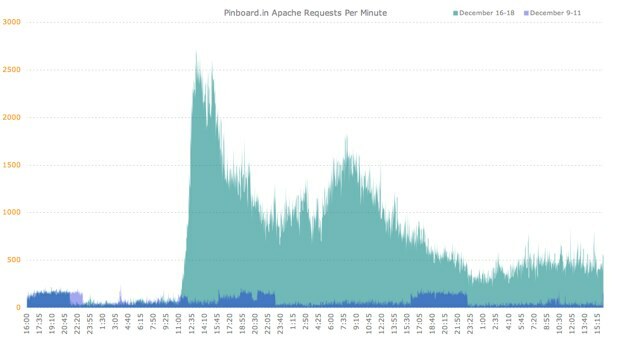 The service wasn’t handling a huge number of requests to begin with—a few hundred per minute at peak—but that number increased about tenfold to over 2,500 requests per minute. Pinboard allows you to import your bookmarks out of Delicious. Mike suggested switching from Delicious more than a year ago. But from what I can tell it only has about 9,000 users. You are asked to pay a one-time fee to sign up, which helps to prevent spammers from joining. The current fee is $9.07 and it is based on the number of users. So not a whole lot of Delicious users switched to Pinboard, but it was enough to move the needle for the small bookmarking site. Update: Pinboard says it has closer to 16,000 users. The longer Delicious remains in purgatory, the more users are going to look for alternatives like Pinboard. The site even provides an honest list of pros and cons for those considering the switch.